Allison designs commercials for Target and other companies, and though I haven't met her, I can tell she's lots of fun. See more inspiring photos from her wedding right here. And let me give a shout out to Mary Basnight, the photographer and designer of the photo book. Great work, ladies! Wow! That's 100% awesome. Go you, Jessica! Amazing! Congrats, it's so neat to see what people do with the fabric. COngratulations! The fabrics look great and I love how creatively they were used at this awesome wedding!! Wow! Whodathunk your Boardwalk would have a use like that! What fun! this is beautiful!!! makes me wish i had a real wedding!! Mum, I know—apparently my Boardwalk fabric is on a boardwalk! i love everything about this- the prints, the wedding decor, the photos! I coordinated Allison and Mike's wedding here at the Sanderling Resort and Spa. They were such a great couple to work with and their personality spoke through their design elements. 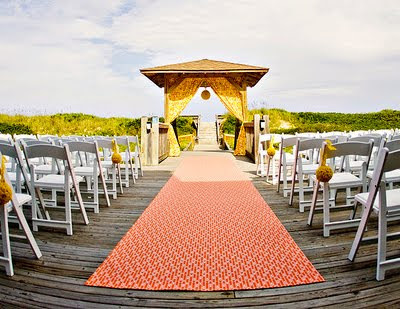 We showcase this wedding all the time of how to incorporate color and textures for a wedding at the beach. oh my, that is so fabulous! holy moly, that must be such a cool feeling when you see something you've designed being used so beautifully. SO gorgeous. 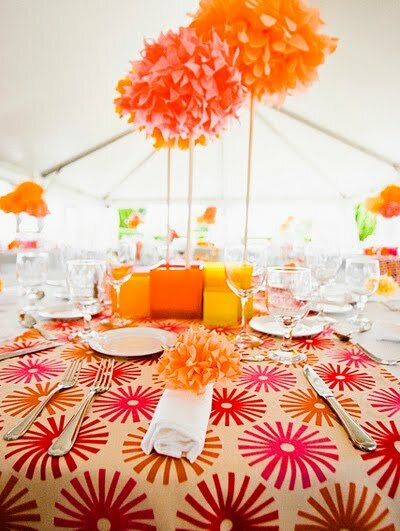 I adore oranges and pinks together and the styling and color combinations here are fabulous. Thanks for sharing! That looks like a totally fab wedding and your fabrics look great in it! Just fantastic--gorgeous and upbeat and colorful. 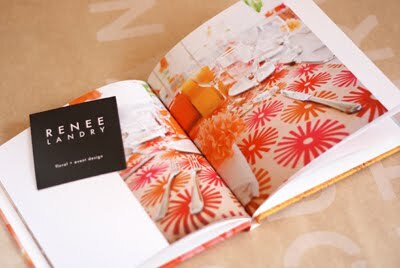 Love the use of your fabrics in this context and SUPER DUPER LOVE that they sent you the photo book. Sometimes the broadness of the internet world allows for people to connect in an old-fashioned, real world sort of way. This is a great example of such. that is amazing!!! congrats....what a fabulous wedding! Wow, that's exciting! Those fabrics are lovely! I don't see the pink/orange fireworks fabric on either of those sites ;-) Are those the only two sources. They are spectacular designs. NmB, the fireworks fabric is here. The photos at fabric.com are pretty muddy and look dark, but that's it. Oh, I wondered if that was the problem but, wow, what a difference in colors between your site and theirs! Congratulations: your designs are wonderful and well-captured in these photos! NmB, I know, it's kinda freaky! But this stuff has only been printed in one red/orange colorway, so that's definitely it! With our Color issue on news stands, color is definitely on my brain. I love your fabrics and the mix of patterns she used are just perfect! What a beautiful wedding! Congrats! I am so happy for you. Your prints are awesome. I love the way she styled with them. LKP, I love the orange and blue combo! Fantastic! Your fabrics look great at a wedding. I'm glad to see real COLOR at a wedding!! Everyone always uses those watery not really a color color for their weddings. What a wonderful honor. What a beautiful wedding. Congratulations! Congrats! I love your fabrics and they are beautiful in the wedding;) Loving it!!! So bright and cheery! Love it! Love it! That is so fun! Just discovered your sign. Its amazing! The paper clips hearts are genius by the way! wow! That looks like my kind of wedding! This wedding is stunning and your fabrics are perfect. Congrats! So great -- beautiful use of your fab designs! Beautiful pics. And gorgeous fabrics! Beautiful! The colors are just stunning and your fabrics really brought the settings together. 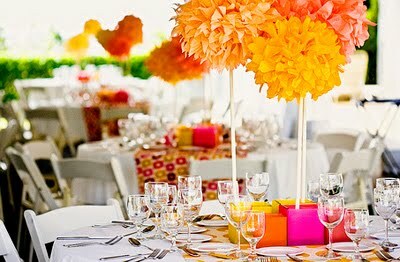 Wowww, love orange for a wedding. Your fabrics looked great out there! 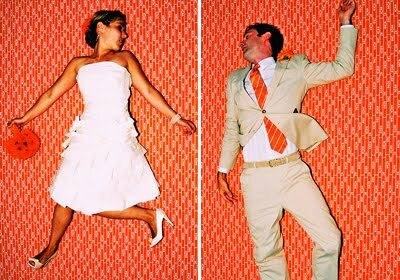 Is the orange print used in the photo shoot background also one of your designs? If so, can you share the name of that print? Thanks so much...love these photos! Hi Lisa, it is. That print is called Boardwalk, but it's been out for a while and I think it might be sold out everywhere.